Carols, wassailing songs and traditional tunes from England, Wales, Scotland and Ireland. Two folk musicians who are both rising stars in their own right, Harriet Earis and Sharron Kraus have created a programme of seasonal, evocative duets that are authentically traditional in style – timeless and unique. Mixing the lightness of the dulcimer with the deeper Celtic harp, mellow whistles and haunting vocals, their music recreates an ancient wintry soundscape punctuated with warm Christmas cheer. They mix traditional carols from all over the UK and Ireland with some of their own compositions and foot-tapping tunes associated with winter, everything from medieval Welsh Plygain carols to lively Shetland jigs. The music has depth and soul, with many unusual and little-known tunes as well as a few carols that are old favourites to set the scene, all arranged with taste and sensitivity. 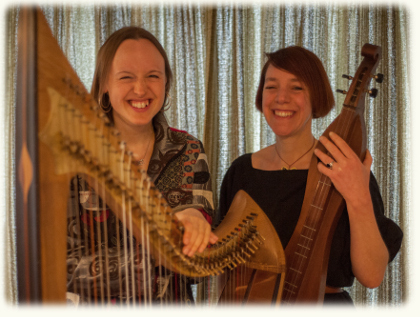 Harriet and Sharron together have formed a sound that epitomises the midwinter season whilst also reflecting their own tastes and individual styles on their instruments. This is a special chance to hear two exceptional traditional musicians come together to make perfect music to bring in the winter season! 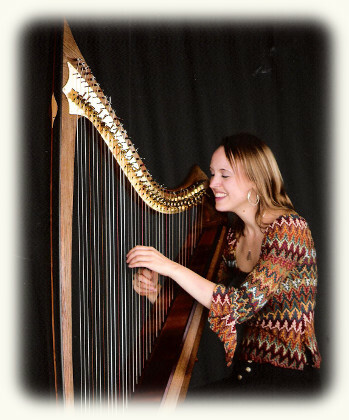 Harriet Earis has Grade 8 with Distinction in classical harp but now specialises in the smaller Celtic harp, with a degree in Celtic Studies from Trinity College, Cambridge. The Musicians’ Union magazine has described her as “a star in the British folk firmament”. She was “Harper of All Britain” twice in 2000 and 2002 and won a coveted Open Stage Award at the UK’s biggest traditional music festival “Celtic Connections” in Glasgow in 2007 – chosen from over 82 acts competing for the title. She is a busy and successful soloist giving regular harp recitals across Europe and America (to over 25 different states). She has performed solo in the Royal Albert Hall and the O2 Arena as part of the “Young Voices” Tour 2007 and also represented Wales in the Festival Inter-Celtique in Lorient, France 2008. In 2005 she became one of only a handful of Welsh musicians to be awarded a place on Yehudi Menuhin’s “Live Music Now!” scheme, which led to numerous concerts in community venues as well as solo recitals in most of the main Welsh festivals and an invitation to Buckingham Palace to meet the Queen at a reception honouring “Young People in the Performing Arts” in 2011. She has two solo CDs, “Jumping Ahead” (2003) and “From the Crooked Tree”(2007) and her compositions have also been featured on TV and radio, including a BBC medieval series programme. When she is not performing, she teaches the harp from her home in mid Wales and leads masterclasses and harp workshops around Britain and Europe. She is keen to show a new way of playing the Celtic harp, using it as a strong melody instrument for lively, foot-tapping tunes as well as straying into jazz with her trio of harp, bass and drums. 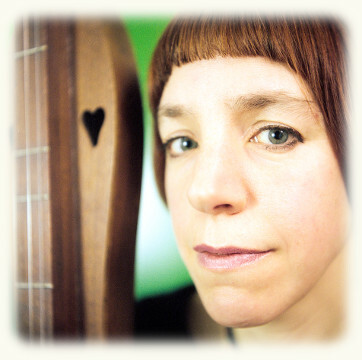 Sharron Kraus is a singer of traditional folk songs, a songwriter and multi-instrumentalist. She has released four solo albums, the first of which, 'Beautiful Twisted', was named by Rolling Stone in their Critics' Top Albums of 2002. As well as her solo work, Sharron has recorded an album of traditional songs - 'Leaves From Off The Tree' - with Meg Baird and Helena Espvall of Espers, written an album of songs to celebrate the seasons of the year - 'Right Wantonly A-Mumming' - which was recorded with some of England's finest traditional folk singers including Jon Boden, Fay Hield and Ian Giles - as well as recording and performing as a duo - Rusalnaia - with Ex Reverie's Gillian Chadwick, with Tara Burke (Fursaxa) as Tau Emerald and with Irish free-folk collective United Bible Studies. Sharron has been featured in The Wire, fRoots, Uncut, The Sound Projector and Dirty Linen, and is one of the musicians focussed on in Jeanette Leech's Seasons They Change: The Story of Acid, Psych and Experimental Folk. She has appeared on Radio 3's 'The Verb', and recorded sessions for BBC Radio Scotland, BBC Radio Shropshire, Freakzone on Radio 6, and independent radio stations across the US. Sharron is currently working on an album of songs inspired by the Mabinogion.